Looking for peace and quiet in a luxurious setting? 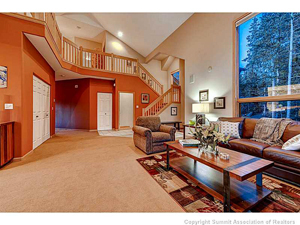 Then this 4-bedroom, single family home in Breckenridge, CO is just the property for you. Located at the very end of a tranquil cul-de-sac, you’re sure to enjoy this gorgeous house with vaulted ceilings and an open floor plan. In terms of space, this property has a large family room and even an room that could be easily converted into a sleeping area. You’ll never have to worry about being unable to accommodate all of your family and friends visiting for the skiing or biking, you’ll have plenty of room for everyone! Also, if you’re drawn to homes that bring in plenty of sunshine, you will definitely fall in love with this property. Light pours in from the home’s prominent windows and the lovely deck. Plus, you’ll always have access to the phenomenal mountain views that surround this exquisite home. Finally, your new house is close to the bus stop so skiing and downtown Breckenridge are just minutes away. Don’t forget this home is also near a fantastic trail system so if you like snowmobiling, 4-wheeling and cross-country skiing, you don’t have to go far at all. Needless to say, this 4-bedroom house is a true gem that includes a great deal of wonderful features…it’s exactly the type of property most clients have in mind when they think about looking for a property for sale in Breckenridge. As you can see, this amazing place in Breckenridge has numerous qualities that make it stand out from the competition, and it probably won’t be on the market for very long. If you’d like to see the home in person, I can arrange a showing as soon as you’re ready. Give me a call and I’ll schedule a convenient time that works around your schedule. If you’re just starting your research on properties for sale in Breckenridge, you can always start with an MLS search of the updated listings on my website. When you’re ready to discuss your options or prepare for showings, contact me at any time via email ([email protected]) or on my office line. I look forward to working with you!